Actress Marion Davies built her own private oasis in Rancho Mirage. And after a top-to-bottom renovation, her secret hideaway will become a high-end venue for special events. A large ballroom is just off the entrance. It features some of the furnishings that are being custom made for the home including Brazilian rosewood chairs that came off the Queen Mary, Milo Baughman sofas, Vladimir Kagan chairs, and a 100-year-old, handmade Persian rug. Behind the wall of mirrors, left, is an all-pink kitchen—one of four kitchens in the house—that will be used for catering. Just down the block from Sunnylands — the mega-estate created by publisher Walter Annenberg — is a smaller, more discreet property that also has a media pedigree. Hidden behind a nondescript gate flanked by pink pillars sits a Mediterranean-style home commissioned by actress Marion Davies, the longtime mistress of William Randolph Hearst. A grand circular drive leads to the entrance of the home built by actress Marion Davies in 1956. The house is painted a special shade of pink known as Marion Mauve that Davies used on all her homes. After Davies’ death in 1961, her husband sold the property to Trader Vic, the inventor of the now ubiquitous Mai Tai. Later, the 5,000-square-foot home was purchased by a couple who added a 9,000 square-foot-addition for a total of 10 bedrooms and 13 bathrooms. The aptly named “grand corridor” impresses visitors as soon as they walk through the front door. 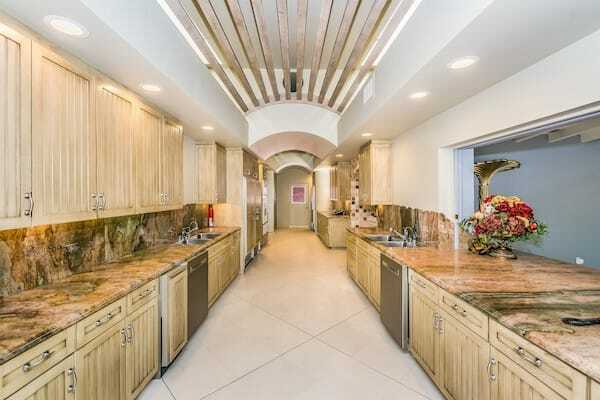 An enormous kitchen was added in the 1980s and has been completely updated by interior designer Carlos King. 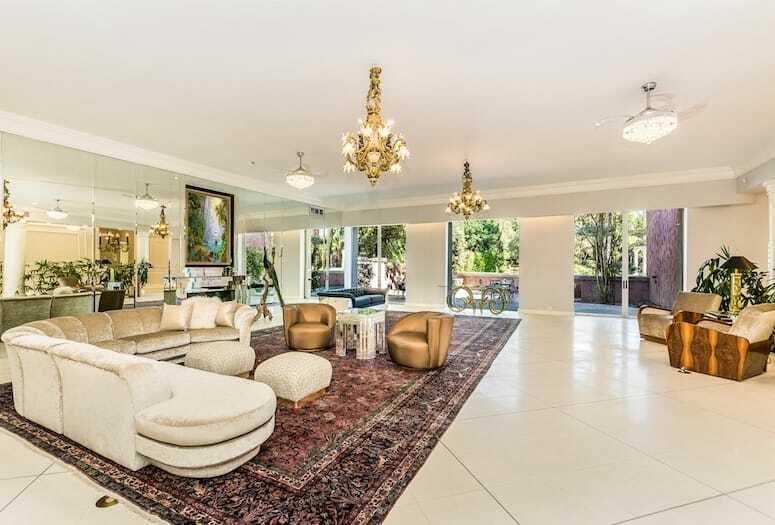 Interior designer Carlos King of King Concepts & Design is overseeing the home’s renovation and his task is to marry the over-the top 1980s excess with the 1950s glamour of the Davies era. King, who is a Palm Springs native, has a background in landscape architecture, interior architecture, and interior design. He left the desert for college, but his first job brought him back home to Rancho Mirage. “So I grew up with all the mid-mod aesthetic and also all the old Spanish architecture,” he says. On a recent tour of the property, he provided guests with a vision of what’s to come. As you enter the home, the grand corridor awaits — grand being a bit of an understatement. Just off to the right is a ballroom featuring some of the furnishings that are being custom made for the home. “[We’re] going with a French Deco aesthetic with a mix of Hollywood glam,” says King. In the ballroom, that translates to Brazilian rosewood chairs that came off the Queen Mary, Milo Baughman sofas, Vladimir Kagan chairs, and a 100-year-old, handmade Persian rug. A bit further down the grand corridor, a wall pivots to reveal what King calls “Ali Baba’s Cage.” A hidden passageway takes you into a home within a home complete with amenities such as a gym, panic room, Lucite closet, and a bathroom with a shower surrounded by live papyrus trees. At the end of the grand corridor you enter the original 1956 house, with a few twists—one being a huge kitchen added in the 1980s that’s being updated by King for the 21st century. There are tongue-and-groove ceilings throughout this portion of the home and once the renovations are complete, all of the bedrooms will be named after a star of the period. The pond is one of the property’s unique features. There are little trails that take you around the grounds and as part of the current renovation all of the landscaping is being redone. “The coldest room in the property is one in a corner and that will be the Joan Crawford suite,” says King. “The casita will be the Elizabeth Taylor room so that’s going to have a lot of rich cobalt blues, lavenders, and gold.” The Marion Davies suite is getting a new bathroom with a claw foot tub and has beautiful views of the tennis courts and pond. Clark Gable is said to have been one of Davies’ lovers so the suite right next to hers is named after the actor. There’s almost an acre of land toward the back of the estate and the new owner is building a pool that will have cabanas on each side. The existing pool, shown here, will then be used as a water feature.